Wet snow and mud slides in May are not an unusual occurrence, especially after a big winter’s snowfall that is followed by a very wet spring. Bare ground or a snowpack that is being saturated with water due to melting snow become well lubricated and poised to move downhill. 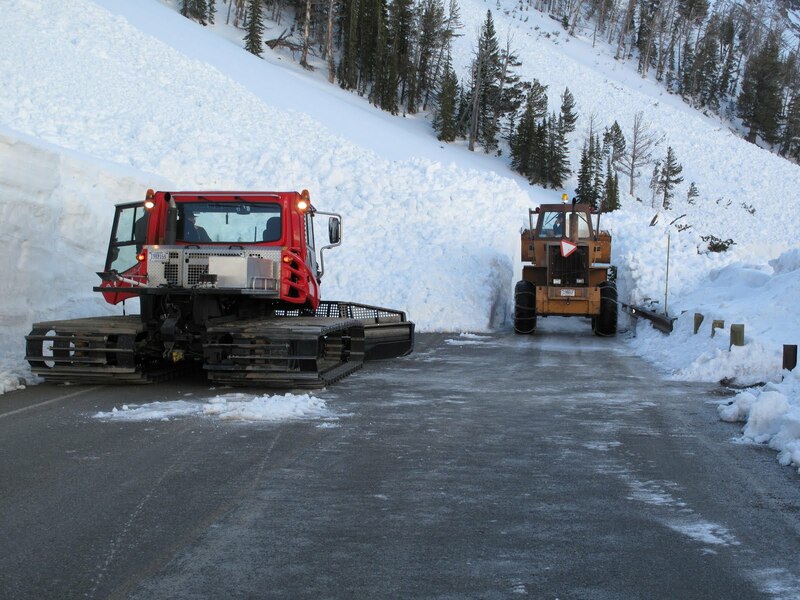 Big landslide and snowslide events have been responsible for closing roads around the Yellowstone and Jackson Hole area this May. On Sylvan Pass in Yellowstone Park a cycle of wet slab avalanches blocked the highway with avalanche debris up to15 feet deep on May 11th, 2011. While I am still in the process of investigating all the details of the snowpack and weather leading up to this event, it seems that the sequence of events that provoked these slides goes something like what is described below. Rain and warm temperatures at the beginning of April were followed immediately by colder temperatures, forming hard crusts up to around the 10,000-ft. elevation. That was followed by heavy snowfall the second, third, and into the fourth week of April. Temperatures then warmed in early May, reaching a peak around 50 without refreezing overnight at the end of the week, with more wet snow and rain May 6th to 8th. All that new snow from April & early May was warming and it is likely that free water was able to percolate down to the rain-crust layer that formed in early April, providing a well lubricated sliding surface for the avalanches to run on. 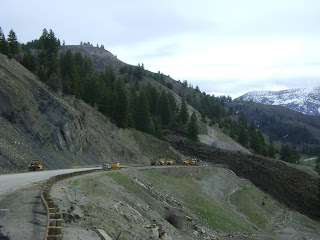 As far as the landslide down in the Snake River Canyon, this is the second major slide in the canyon this spring. An earlier slide on the opposite side of the river did not affect the highway and was given little attention. The one that occurred this past weekend (May 14th and 15th), was also likely provoked by the weather this spring. Overly saturated ground from melting snow from an above normal winter snowpack, compounded by much above normal precipitation in April and early May, further saturated the soil, and is what likely set that soil in motion. I would defer to the geologists to further explain what exactly is going on with the soil and rock strata down there in the Snake River Range. (see quote below). But without a doubt, excess water on the ground this spring contributed to the movement. (See more about this landslide and more photos on Jim Stanford's site at JHunderground.com). "The stratigraphy is filled with clay layers and the overthrust has bent and folded layers onto complex structures. Erosion exposes the dipping folded structures. Resistant layers act as boundaries, water as lubrication & gravity energy. Tilted beds and a dipping anticline contribute to the present landslide." You may recall that there was a similar large landslide in the Snake River Canyon back in May of 1997, almost to the day, on May 18th. I thought it would be interesting to look at the weather in the Winter & Spring of 1996-97 and 2010-11, to help explain how it may have contributed to setting these landslides in motion. While both years had way above normal snowpack going into the spring..... April-May 1997 and April-May 2011 had completely different weather conditions. April & early May 1997 was drier and warmer than normal (below normal precipitation, above normal temps). The week prior to the May 18, 1997 landslide we were had highs in the 70’s in Jackson, and one day with just over ¼ inch of rainfall between May 16 & 17. April & early May 2011 was wetter and cooler than normal (way above normal precipitation and below normal temperatures). The week prior to the May 15, 2011 landslide we had only seen a few days that got over 60 degrees in Jackson, but we had almost 2 inches of rainfall. That on top of about 3 inches of rainfall in the month of April 2011. The important thing to keep in mind with both wet snow avalanche and landslide events of this magnitude is, that they are both extremely hard to forecast for. It is easy to “backcast” after they occur and point to specific weather that likely caused the massive failures, but beforehand, it is purely speculation that they could occur. And certainly pin-pointing exactly where they might occur is even more difficult.